Exif Editor is your preferred program to edit image EXIF and IPTC metadata on the Mac. The easiest and the simplest way. Manage and modify metadata directly inside your photos. Supports subset of EXIF and IPTC metadata standards. Edit or remove the data. The workflow is very straightforward. You just perform couple of easy steps to make your work done. The first step is opening file(s) you want to edit. You can use the standard open dialog or drag and drop the files into the main window. Once the files are opened, they appear in the list of open files on left side of the window. The next step is to make the changes to your files. Just select one or more files you want to edit and make the changes in the data on the right side. The last step is to hit the “Process” button that automatically processes all changes at once. By editing multiple files at once, you can greatly simplify your workflow. You don’t need to edit single files one after another anymore. Just simply select all files you want to edit and change the individual tags. Because saving files is usually not the fastest thing you can perform, the program saves all edits at once. You can remove either all metadata from the pictures or you can clear the tags individually. This allows you, for example, remove all location information from the images. Exif Editor has a number of handy editors for various types of data. This allows you to comfortably edit tags. Some options can be filled with a selected number of options. You can choose one of them. Custom date/time editor allows you to edit either fixed date/time or shift the date/time by a specific amount of hours/minutes/days to adjust correct invalid camera settings. 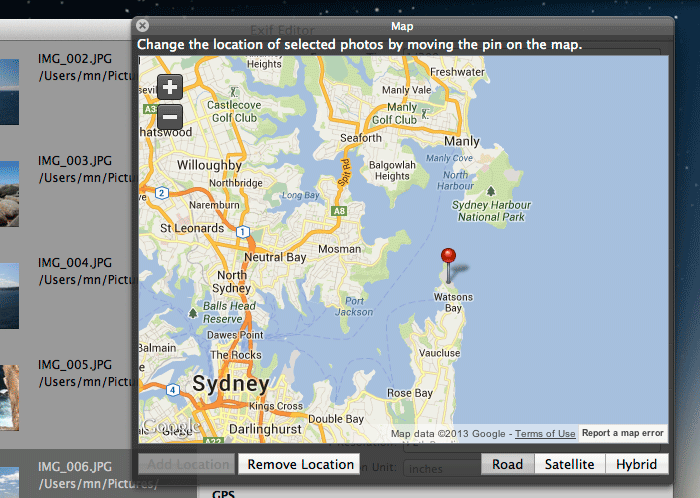 You can use a map window to see position of your photo(s) on the map. You can also edit the position on the map simply by dragging the red pin on the map. Besides the map, you can also view the exact GPS numerical values. This can allow you, for example, to copy and paste the coordinates to maps in your browser. Exif Editor has supports the following various file formats – including JPG and various RAW. Have a look into technical specification of currently supported tags. Read the manual & FAQ. The Apple logo and MacBook are trademarks of Apple Inc. App Store is a service mark of Apple Inc.